Find a therapist in Texas with GoodTherapy.org. Texas has the second-largest state population in America, with 2015 estimates in the region of 27.5 million people. From 2010-2014, the median household income for people living in Texas was $52,576. Approximately 106,560 people were working as licensed social workers, health educators, therapists, and in social service and community service jobs in 2015. In Texas, therapists and people in similar fields take home a mean annual wage of $47,210. In a nationwide survey conducted in 2016 by Mental Health America (MHA), the state of Texas was given an overall mental health rank of 33rd, indicating a combination of poor access to mental health care and somewhat high rate of mental health conditions in the state. Therapists in Texas and researchers from Mental Health America posit the state’s low access ranking may be related to high rates of toxic chemical release in Texas. The 2016 MHA survey estimates almost 3.4 million adults in the state live with adverse mental health conditions. Texas has the fifth-lowest percentage of adults with serious suicidal thoughts, and the 12th-lowest percentage of adults with substance dependence issues. However, the data suggests there is a higher prevalence of mental health issues among the younger population. Texas placed 40th for adolescents with past year episodes of major depression, 31st for young people with severe symptoms of depression, and 30th for youth abuse and dependence on illicit drugs or alcohol. 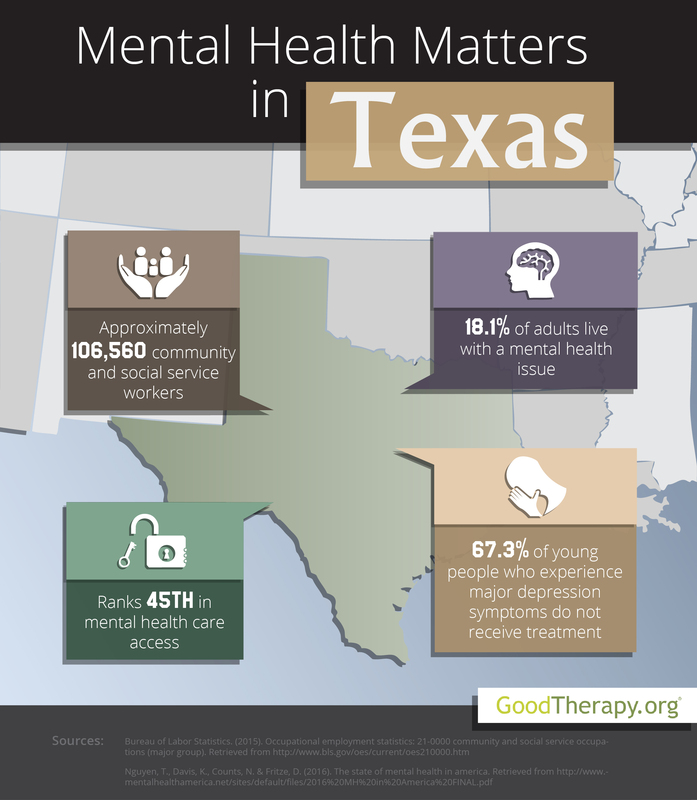 Easy access to needed mental health care remains a pressing concern for therapists in Texas. Mental Health America revealed the state was ranked 39th for adults with mental health concerns who did not receive any treatment, 48th for adults in need of care who have no mental health coverage, 40th for adults with disabilities who could not pay for treatment, 43rd for children with private insurance that does not cover mental health issues, and a low 50th in the availability of mental health providers. In 2016, there is a ratio of 1,034 residents to every single mental health provider in the state.